Don't miss any of the Fleet Week fun! Take a special tour of the vessels (through Monday Oct. 8 from 1:00 – 6:00 PM) and experience the life of a modern sailor! U.S., Canadian, and British Navy vessels along with U.S. Coast Guard and others are docked around the Inner Harbor, Fells Point, Tide Point, and North Locust Point. View the locations of where each vessel is anchored throughout Baltimore. 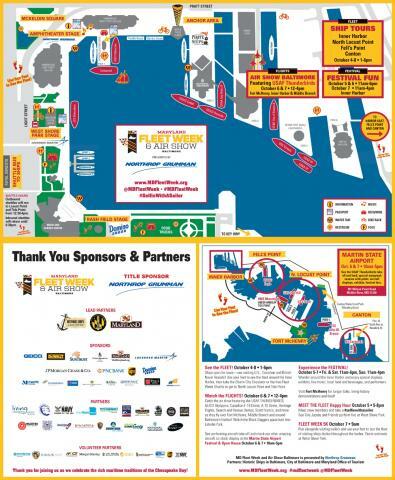 Experience the expanded Fleet Week Festival, stretching from Rash Field and the Maryland Science Center around the promenade to the National Aquarium, filling the Inner Harbor with exhibitors and vendors from maritime, military, cultural, and historical organizations! Enjoy hands-on activities, local food and drink, musical acts, and other entertainment! Join visiting sailors for special happy hour in West Shore Park featuring performances by Cris Jacobs Band and Friends! Use your feet to see the fleet! Join U.S., Canadian and British sailors for a 5K run through the Inner Harbor. Registration fee – proceeds benefiting Historic Ships in Baltimore. There will be three stages rocking throughout the festival located at the Amphitheater, West Shore Park, and Rash Field’s Kaufman Pavilion! Check out the schedule for entertainment October 5-7. This year, the Fleet Week Festival will add more local flavor by incorporating three regional independent breweries. Atlas Brew Works, Heavy Seas Beer and Union Craft Brewing will offer their signature beers at Rash Field, West Shore Park, and Pier 1. Red and white wine will also be available. There will also be a fleet of local food trucks and vendors selling their signature goods – a great mix of sweet, savory, spicy, and more! Fort McHenry National Monument & Historic Shrine is open daily from 9AM to 5PM. Enjoy ranger talks, living history demonstrations, food, and entertainment. (Programs may be limited during air show.) The park is the prime viewing location for Air Show Baltimore! NOTE: No parking at the park on Saturday and Sunday. View unique and contemporary aircraft on the ground at the Martin State Airport Open House and Free Festival. Watch airshow aviators take off and land from this location! Activities will include meet and greet sessions with the pilots, displays of military aircraft, musical entertainment, souvenirs, and food vendors.